We have recently moved house. I’ve moved out of my family home in Norfolk and Josh has moved from a few streets away. We’ve now moved into our little flat in Chatham, which we have nicknamed ‘The Batcave’, but that’s a story for another day. So anyway, whilst clearing out his old house we hit the jackpot and in the freezer we found a bag full of chicken breasts and four steaks! I love Dim Sum – I’ll be writing a post about that soon – and I absolutely love to make my own dumplings. So tonight… And bare with me here because I know it’s weird… We had steak dumplings with peppercorn sauce. To start with I just want it to be known that I never make my own dumpling skins. I’m pretty sure it’s only flour and water but there’s definitely a knack to getting them so round and thin.. When they cost £1.30 from the thai supermarket in Chatham I just think I’ll save myself the time and buy them – you can buy them online too but I’m pretty sure most towns now have some kind of Asian or oriental supermarket – they’re usually found in the freezer. I added some chopped up bean sprouts to the dumpling filling to give it more of a chinese element but other than that I let the steak do the talking! I chopped that into pretty small pieces though as it needs to cook quickly when it’s steamed. Step 1: I separated some of the dumpling skins, sometimes they can get a bit stuck together so it’s good to get them out ready a few at a time. Step 2: I then put a little bit of filling in the middle. 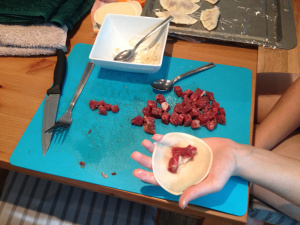 Step 3: Get a little bit of water on your finger and wet around the edge of the dumpling wrapper. You then pull the two sides up and press them together to make a half moon shape and then crimp it to give it it’s crimped edges. There’s a really great article here by Food Nouveau which explains it a little bit better and even shows some other shapes and fillings. The dumplings I made were half moon shaped and are known as ‘potstickers’. The next step is to fry them. Do this in a nice big frying pan or skillet and try not to crowd them too much. Some people fry them on both sides to make them nice and crispy but this time I only fried them on one side so you still get that nice doughy dumpling texture. Once they’ve gone adequately brown (this should only take a couple of minutes so if they are still white and kinda bubbly looking – you pan might not be hot enough), pour some water into the pan and quickly put a lid on top! The general rule of thumb is about 60ml or 1/4 cup of water for every 12 dumplings. Let the dumplings steam for 4-5 minutes to make sure the filling is cooked through and then take the lid off to let any remaining water evaporates off. You can always do this the other way round too – you can boil them and then fry the bottoms. 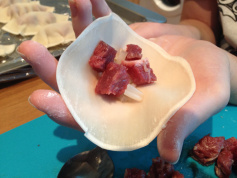 This other method would work really well for other shaped dumplings (like the little square parcels) but with the half moon ones I’d be worried it would get soft and spill all the filling like over-cooked ravioli… I’m sure it can be done, I just haven’t risked it so can’t comment! 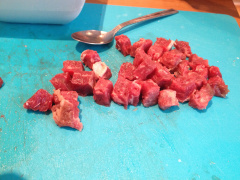 Another tip is not to overload the wrappers – only use a small amount of filling and as you can see I’ve chopped the meat up quite small. 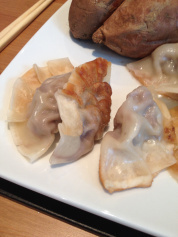 You don’t want to risk the dumpling splitting while it cooks or coming unstuck! So how did it taste? You know what? Not that bad, I just made a peppercorn sauce for dipping and served them with a sweet potato. Sounds a weird combination but it was pretty tasty and because the dumplings had been fried a bit before they were steamed they held their shape really well and were sturdy enough to pick up and dip. Traditionally dumplings have flavours like chicken and mushroom, char siu pork or pork and chive but I think steak and peppercorn might have a place in my recipe book from now on! I am Chinese and have eaten and cooked a million dumplings in my time and never made the wrappers. I think store bought is perfectly fine. There is enough work involved without having to make the wrappers! When I make a big batch of dumplings, I don’t serve them with anything as I feel they are a balanced meal already. Just some black vinegar, chili sauce and a bunch of chopsticks. If I were to make the wrappers too – I would need some extra hands to help me or I’d be there all afternoon! YUM that sounds good!